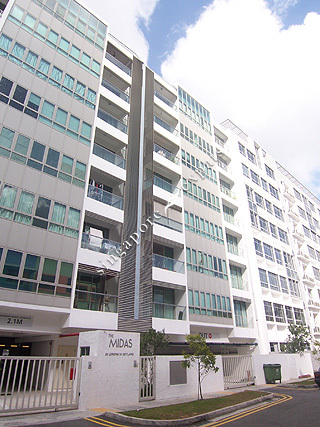 THE MIDAS is located at 26 LORONG 30 GEYLANG in district 14 (Eunos, Geylang, Kembangan) of Singapore. THE MIDAS is a Freehold Condo development. Educational institutions like ETONHOUSE INTERNATIONAL SCHOOL, CANADIAN INTERNATIONAL SCHOOL (TANJONG KATONG), CHATSWORTH INTERNATIONAL SCHOOL (EAST), KONG HWA SCHOOL, GEYLANG METHODIST SCHOOL (PRIMARY) and MACPHERSON PRIMARY SCHOOL are near to THE MIDAS. THE MIDAS is accessible via nearby ALJUNIED, DAKOTA and MOUNTBATTEN MRT Stations. Nice good food and 24hrs eating shopping in Geylang area. Quiet clean nice environment. Security card access. car park remote control entry. Cosy modern condo, nice layout, lot of light, balcony and swimming pool. Quiet environment due to small numbers of residents.